Well, I didn’t feel the last dragon I designed was feminine enough. The idea I have in my head is that she is going to be like a teenage girl in a dragon’s body. My plan is to call her ‘Suzi’. So first I simplified my previous design a bit and then tried it out sketching three views – front, side and three-quater view. I found the different views of this design difficult and fiddly to draw. If she’s going to be a main character I need something cute but a bit more simple. Then I came up with..
Now I think I’ve finally got a dragon design I can really use. SO my next step is going to be to make to better quality drawing of all three views and see what style of lineart I want to use and what, colour or greyscale shading. So although I’m going to change my dragon design I thought I’d use the old design to play around and look at what colour she’s going to be. My favourite colours are actually opposites on the colour wheel – blue that’s really close to purple and yellow that’s really close to orange. I gave these a try. Then I added some shading and changed the eyes. In making my ink drawing I’d put the shine for the eyes on the left and then went on and put the shadows for the whole picture on the left too which is wrong. To correct this I deleted the drawn eyes and repainted them digitally with the shine on the right. I also removed some line work on the nose which I don’t like. All of this except the border was done in Manga Studio which I find much easier to use than photoshop for this kind of work. I like the way his face looks kind of fox-like which makes him more cute than the more reptilian styled creatures. The other thing I liked were the horns and spikes on a picture from the “Wiki – How to Draw a Dragon page.” It’s a very basic design but I really liked the idea, albeit in a different format. She’ a bit odd, she can be a bit cute but I think I could make her very fierce too which seems good for a story dragon. Looking at her now I think I might change the design a bit in the future and add some of those traditional tendrils which extend from below the nose. Firstly they would look totally cool but more importantly she can use them as additional limbs to show her friendship with my male character Sam,. the fisherman. However, if I do that I might need to reduce the general complexity of her head by maybe removing some of the horns or simplifying them. We’ll see. I’m going to make a coloured digital version in the next few days. Today I drew my manga fisherman, ‘Sam’, in three-quater front view. This is the view I worked on before I attempted this fisherman exercise and I think I did find it easier because of the previous work. Then, rather than using the same process as before, I wanted to try something one of my favourite comic artists does. His name is Doug Wheatley and he drew some of the Dark Horse Star Wars ‘Dark Times’ series. Here’s his cover art for ‘The Path to Nowhere’ from than series. I really love the line art in Doug’s work, the softness it has and the detail. I reseached this for ages, wanting to know how you get it like this and I think he scans in his pencils and uses them instead of inking. In an interview I read he talked about doing this and then adjusting the levels to get it to look just right. So I thought I’d have a gotat using my pencils instead of ink. I drew a pencil drawing. Then I scanned it, adjusted the levels and coloured it. I put the line work on top and used photoshop’s ‘multiply’ blending option to bring the colour through the line art layer. This is the final version with standard cel shading. I think it kind of works, although I think next time I will have to keep my pencil work cleaner and more accurate. I’d also be interested to see what this technique looks like with full 3D effect gradient shading. I might try that when I’m working on another design. Here’s the side view version of my manga fisherman, ‘Sam’. Then I scanned it in a used it for reference to ink the drawing digitally. Then I coloured and shaded it. To make sure the colour was the same as the front view I used the eye dropper tool to get the exact same shades. Next time I’m going to try a three quater view and see if all that studying has paid off! Yesterday, through the post came Mark Crilly’s two books about how to draw Manga. Some of the stuff in them I already know but a lot of it I don’t. However, all of it looks fun so I’m going to work through it. The first few exercises are on head views of young adult males and females. I thought, to make this a bit more fun, I would try to create a male and a female young adult character and then attempt to draw them in different views. While I’ve drawn manga heads before, I’ve never yet attempted to draw an individual character from many views, which I’m guessing is a vital skill for writing comics. So, I thought I’d start with the young adult male. This morning, just before I sat down to draw, I went off to a local commercial fishery to collect some fishing gear I had on order. Last weekend I had my first ever fishing lesson there. It was brilliant! I totally loved it. The lad that taught me was quite young but he was still a very good teacher and very knowldgeable about fishing. Because of the chronic pain condition I have I can no longer go out walking, rambling and hiking, which used to be a big hobby of mine. For a while I felt sad at this loss and then I thought about finding something which I could do instead where I could be outside in a beautiful location without having to walk. Fishing was the ideal solution so long as I could cope with the maggots. Well it turns out I can! So, having been reminded of this wonderful experience this morning, I decided to make my male character a fisherman. I began to sketch using the construction lines Mark outlines in his book. Initial sketch with construction lines. Then I scanned it into my PC and coloured it using a fairly retro colouring method which uses only one or two shades. I really like learning new drawing techniques and theory and YouTube seems to be a good place to do this. Yesterday I watched a couple of good videos. 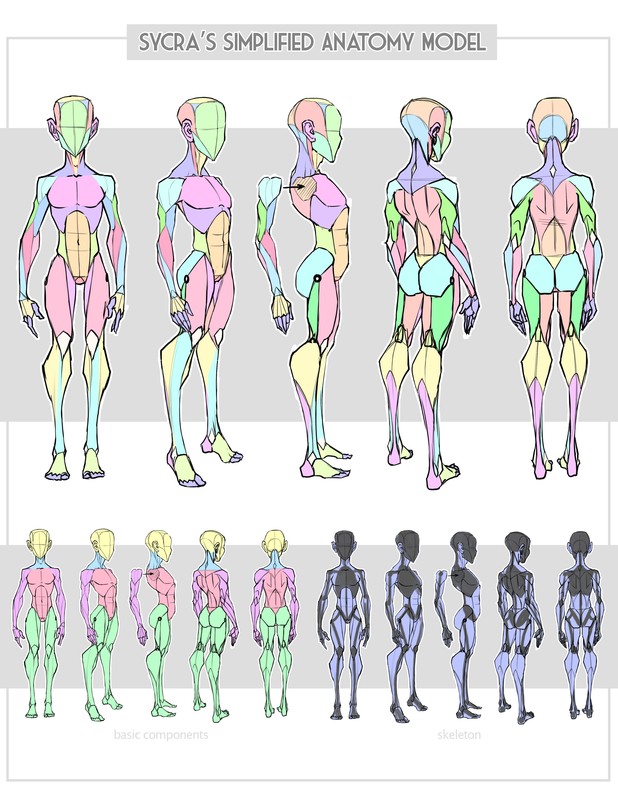 One of them was by Sycra and was about looking at anatomy in a simplified way which I thought was great. His website is at http://www.sycra.net/. And his simplified anatomy model is here. This got me thinking about the planes of the face. Now I’m OK-ish drawing a front view and a side view of a face but I find the 3/4 view quite difficult. I often mess it up. SO I thought I’d work on that a bit. I followed the technique in this pair of videos by “My Drawing Tutorials”. I watched them and then had a go. My first two tries were pretty awful but it was fun to mess around with it. I tried the first two times in ink which was a not a great choice because there’s no going back from a mistake. Last night I watched another Mark Crilley YouTube video where he gives ten tips which helped him to get better at drawing. It was brilliant. Have a look just below if you want. Mark is a professional artist and comic book creator. One of the tips I thought was great was to do some studies of artists you really like. Well I really like Mark’s work so I thought I’d do a study on that. I did the picture of Brody doing situps first and then I did the one of him leaning over catching his breath. For the second one I remembered to take some process photos which show how I built up the sketch. …and then fleshed him out to a regular figure shape. ( I also decided to add feet – just for fun! Then once I’d inked these two sketches I scanned them into photoshop and added some tones. I also added extra shadow tones to the trousers of both figures. I’m really amazed at how watching Mark work on YouTube and then studying his work has helped my line art. I think doing studies of artists you really like is a very powerful tool for getting better at drawing. Thanks Mark – great job! Here’s another quick comic portrait I did the day before yesterday. I gave myself 5 minutes for pencils, 5 minutes for inks and then coloured it in photoshop. This chap was shouting at another man just before I paused the video so I think he’s supposed to be quite cross here. I don’t think I quite got his facial propertions right but I think he’s almost recognisable in a comic book sort of way.